Thompson strainers are produced by Miller-Leaman in the USA. These strainers have very low head loss and are manufactured in stainless steel as standard. 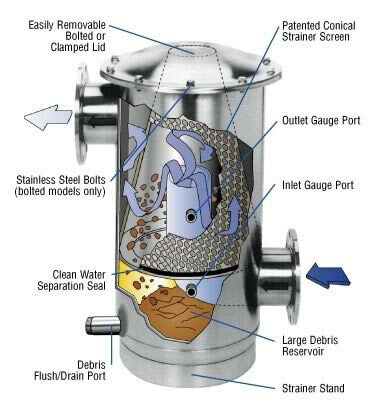 The unique flow pattern in the strainer washes debris down the inside surface of the conical screen, where it is collected in the bottom reservoir. 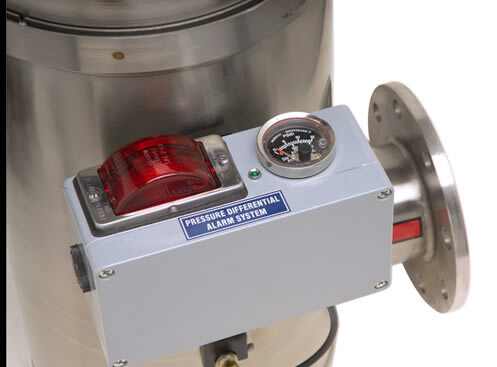 The strainer can be set up with a screen rinsing system, pressure differential alarm and for automatic periodic flushing of the debris reservoir. A new development is the Daytona automatic screen filter which is totally self-cleaning. Connections can be oriented to suit your pipework. The Thompson Strainer as above, manufactured in all 316 stainless steel, primarily for marine applications. 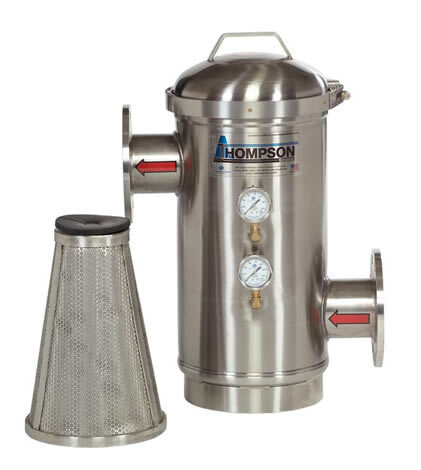 Thompson strainers are also available for food applications. The strainers are finished internally by filling, grinding and polishing to remove all cracks and crevices where particles could accumulate. Long-known for low head loss, large surface area and versatile configuration, the spiral jet rinsing nozzle is now making the strainers even more popular in the food industry. Manual cleaning can be reduced by fitting the Thompson Strainer with a spray system for rinsing the screen in-situ. 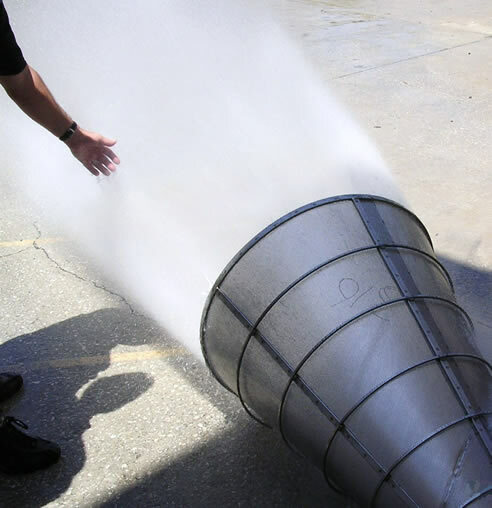 A special spiral spray nozzle in the top of the screen washes accumulated material down into the collection reservoir at the bottom of the strainer, from where the debris can be flushed out of the housing. 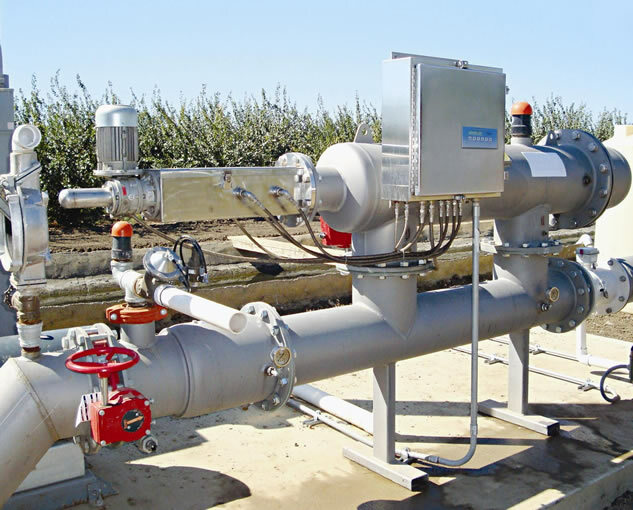 The system is available for the 100 mm, 150 mm, 200 mm and 250 mm strainers. 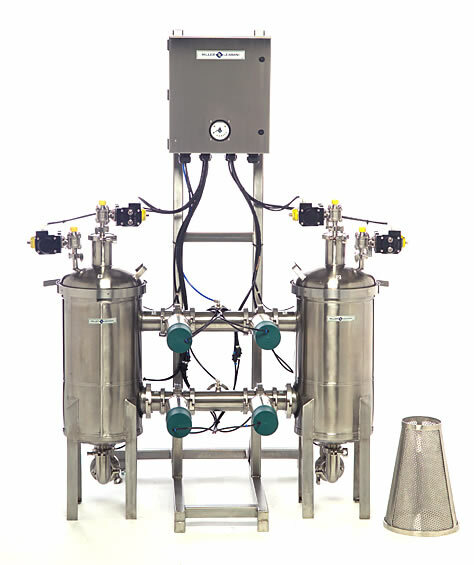 A supply pressure of 400 kPa is required for the rinse water.